Just take a look at some of the big movers in the under-$10 complex from Thursday, including Cesca Therapeutics (KOOL, which is exploding higher by 27%; Ibio (IBIO, which is ripping to the upside by 17%; Synergy Pharmaceuticals (SGYP, which is trending higher by 14%; and Magellan Petroleum (MPET, which is jumping higher by 14%. You don't even have to catch the entire move in lower-priced stocks such as these to make outsized returns when trading. One low-priced stock that recently exploded higher was branded fashions apparel retailer American Apparel (APP, which I highlighted in April 3's "5 Stocks Under $10 Set to Soar" at around 50 cents per share. I mentioned in that piece that shares of American Apparel had been downtrending badly for the last three months, with shares falling from its high of $1.45 to its recent low of 46 cents per share. That action, along with a recent gap down from 80 cents to 46 cents, had pushed shares of APP into oversold territory. Shares of APP were starting to set up for a monster oversold bounce if it could manage to take out some key near-term overhead resistance at 54 cents per share with high volume. Guess what happened? Shares of American Apparel triggered that move with conviction earlier this week after the stock took out 54 cents per share with monster upside volume. The upside volume on Tuesday and Wednesday registered 7.4 and 14.3 million shares, which is well above its three-month average action of 2.13 million shares. Shares of APP have continued to explode higher since, taking out 54 cents per share, with the stock tagging an intraday high today of 76 cents per share. That represents a monster gain of over 50% for anyone who bought up APP below 50 cents in anticipation of that move. This stock continues to act and look bullish from a technical perspective, and it's very possible that it's going to continue its uptrend and tag $1 a share very soon. One under-$10 alternative energy player that's starting to trend within range of triggering a near-term breakout trade is Ballard Power Systems (BLDP - Get Report), which is engaged in the development and commercialization of proton exchange membrane fuel cells worldwide. This stock has been red hot so far in 2014, with shares up huge by 164%. >>Hedge Funds Are Buying These 5 Energy Stocks -- Should You? If you take a look at the chart for Ballard Power Systems, you'll see that this stock has been downtrending badly over the last two months, with shares dropping lower from its high of $8.38 to its recent low of $3.41 a share. During that downtrend, shares of BLDP have been consistently making lower highs and lower lows, which is bearish technical price action. That said, shares of BLDP are starting to improve technically and the stock could be ready to make a trend change soon and break out. Traders should now look for long-biased trades in BLDP if it manages to break out above some near-term overhead resistance levels at its 50-day moving average of $4.14 a share to more near-term overhead resistance levels at $4.28 to $4.34 a share with high volume. Look for a sustained move or close above those levels with volume that registers near or above its three-month average action of 10.61 million shares. 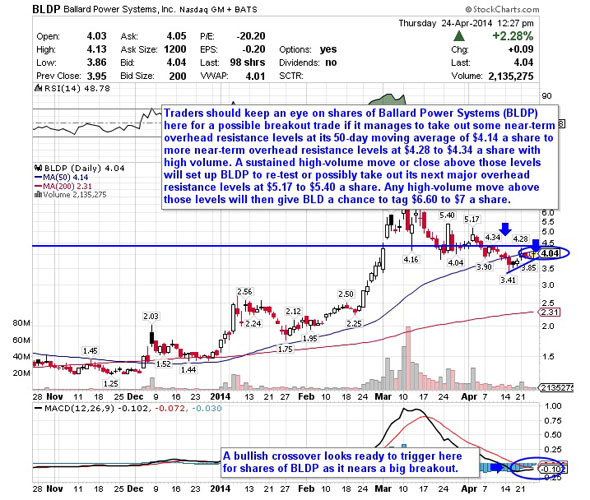 If that breakout triggers soon, then BLDP will set up to re-test or possibly take out its next major overhead resistance levels at $5.17 to $5.40 a share. 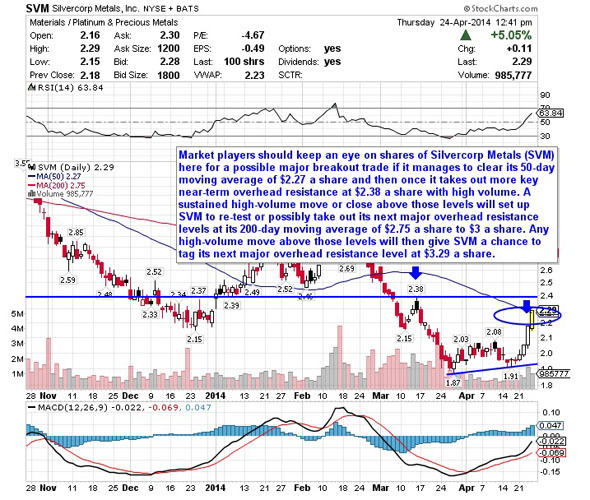 Any high-volume move above those levels will then give BLD a chance to tag $6.60 to $7 a share. Traders can look to buy BLDP off weakness to anticipate that breakout and simply use a stop that sits right around some key near-term support levels at $3.85 to $3.41 a share. One can also buy BLDP off strength once it starts to take out those breakout levels with volume and then simply use a stop that sits a comfortable percentage from your entry point. Another under-$10 energy player that's starting to move within range of triggering a big breakout trade is TransGlobe Energy (TGA - Get Report), which is engaged in the exploration, development and production of oil and gas properties. This stock is down slightly on the year, with shares off by 6.5%. If you take a look at the chart for TransGlobe Energy, you'll see that this stock has been trending sideways and consolidating for the last two months, with shares moving between $7 on the downside and $8.23 on the upside. Shares of TGA are now starting to bounce higher today right off its 50-day moving average of $7.51 a share and it's starting to trend within range of triggering a big breakout trade above some key near-term overhead resistance levels. Market players should now look for long-biased trades in TGA if it manages to break out above its 200-day moving average of $7.80 a share and then once it takes out some more near-term overhead resistance levels at $8.07 to $8.23 a share with high volume. Look for a sustained move or close above those levels with volume that registers near or above its three-month average volume of 156,165 shares. If that breakout materializes soon, then TGA will set up to re-test or possibly take out its next major overhead resistance levels at $8.70 to $9 a share, or even $9.50 a share. 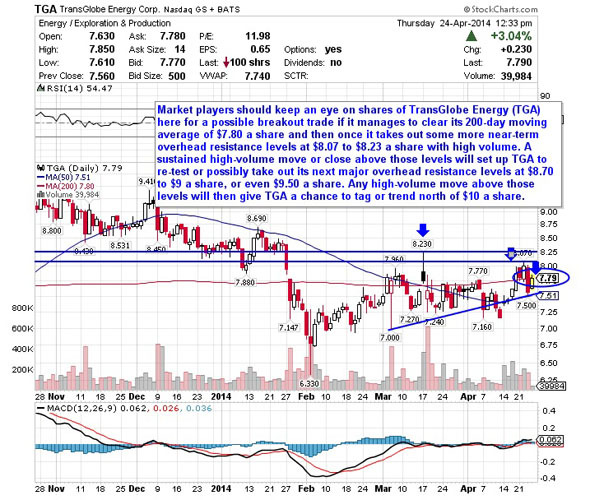 Any high-volume move above those levels will then give TGA a chance to tag or trend north of $10 a share. Traders can look to buy TGA off weakness to anticipate that breakout and simply use a stop that sits right below its recent range low of $7 a share. One can also buy TGA off strength once it starts to bust above those breakout levels with volume and then simply use a stop that sits a comfortable percentage from your entry point. Another under-$10 stock that's starting to move within range of triggering a near-term breakout trade is Clean Diesel Technologies (CDTI, which manufactures and distributes light-duty vehicle catalysts and heavy-duty diesel emissions control systems and products to automakers, integrators and retrofitters in the U.S., Canada, Sweden and the U.K. This stock has been off to a monster start so far in 2014, with shares up big by 82%. If you take a glance at the chart for Clean Diesel Technologies, you'll see that this stock has been destroyed by the bears over the last two months, with shares falling sharply lower from its high of $7.39 to its recent low of $2.25 a share. During that downtrend, shares of CDTI have been consistently making lower highs and lower lows, which is bearish technical price action. That said, shares of CDTI have now started to rebound off that $2.25 low and the stock is now starting to move within range of triggering a near-term breakout trade and possibly reversing its recent downtrend. Traders should now look for long-biased trades in CDTI if it manages to break out above some near-term overhead resistance at $2.89 a share with high volume. Look for a sustained move or close above that level with volume that hits near or above its three-month average action of 1.14 million shares. If that breakout gets underway soon, then CDTI will set up to re-test or possibly take out its next major overhead resistance levels $3.24 to its 50-day moving average of $3.44 a share. Any high-volume move above those levels will then give CDTI a chance to tag re-fill a gap above that started at $4 a share. I would even consider $4.50 to $5 a share as possible targets if CDTI can reverse its downtrend and catch some momentum to the upside. Traders can look to buy CDTI off weakness to anticipate that breakout and simply use a stop that sits right below its recent low of $2.25 or around its 200-day moving average of $2.08 a share. 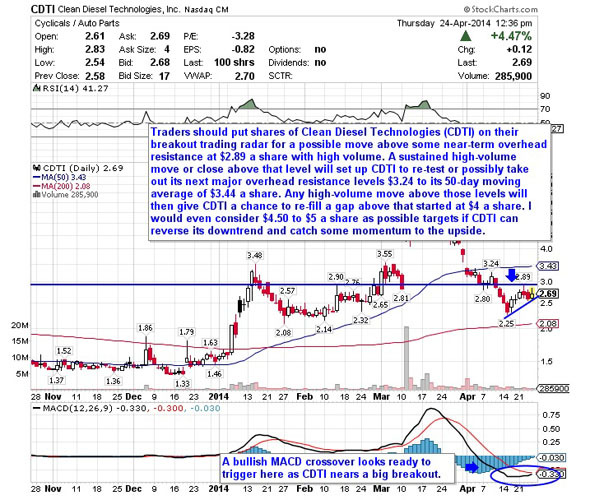 One can also buy CDTI off strength once it starts to take out $2.89 a share with volume and then simply use a stop that sits a comfortable percentage from your entry point. Another under-$10 stock that's starting to trend within range of triggering a near-term breakout trade is Silvercorp Metals (SVM - Get Report), which together with its subsidiaries, engages in the acquisition, exploration, development and mining of precious and base metal properties in China and Canada. This stock has been hit hard by the sellers over the last six months, with shares trading sharply lower by 35%. If you look at the chart for Silvercorp Metals, you'll notice that this stock recently formed a double bottom chart pattern at $1.87 to $1.91 a share. Following that bottom, shares of SVM have started to uptrend strong and break out above some near-term overhead resistance at $2.08 a share. That move is quickly pushing shares of SVM within range of triggering an even bigger breakout trade above some key near-term overhead resistance levels. Market players should now look for long-biased trades in SVM if it manages to break out above its 50-day moving average of $2.27 a share and then once it takes out more key near-term overhead resistance at $2.38 a share with high volume. Look for a sustained move or close above those levels with volume that registers near or above its three-month average action of 1.28 million shares. If that breakout starts soon, then SVM will set up to re-test or possibly take out its next major overhead resistance levels at its 200-day moving average of $2.75 a share to $3 a share. Any high-volume move above those levels will then give SVM a chance to tag its next major overhead resistance level at $3.29 a share. Traders can look to buy SVM off weakness to anticipate that breakout and simply use a stop that sits right below $2 a share. One can also buy SVM off strength once it starts to move above those breakout levels with volume and then simply use a stop that sits a comfortable percentage from your entry point. One final under-$10 stock that's starting to trend within range of triggering a big breakout trade is Pretium Resources (PVG - Get Report), which acquires, explores for and develops precious metal resource properties in the Americas. This stock has been in play with the bulls over the last six months, with shares up sharply by 58%. If you take a glance at the chart for Pretium Resources, you'll notice that this stock has been trending sideways and consolidating for the last three months and change, with shares moving between $5 on the downside and $7.49 on the upside. Shares of PVG are now starting to spike higher today above some near-term support at $5.50 a share. That spike is starting to push shares of PVG within range of triggering a big breakout trade above some key near-term overhead resistance levels. Traders should now look for long-biased trades in PVG if it manages to break out above its 200-day moving average of $6.21 a share and its 50-day moving average at $6.32 a share with high volume. Look for a sustained move or close above those levels with volume that hits near or above its three-month average action of 550,594 shares. If that breakout kicks off soon, then PVG will set up re-test or possibly take out its next major overhead resistance levels at $6.83 to $7.49 a share. 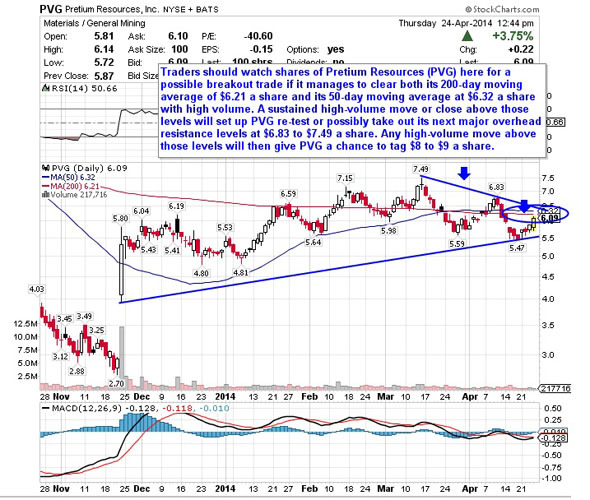 Any high-volume move above those levels will then give PVG a chance to tag $8 to $9 a share. Traders can look to buy PVG off weakness to anticipate that breakout and simply use a stop that sits right below some key near-term support at $5.47 a share or down near $5 a share. One can also buy PVG off strength once it starts to take out those breakout levels with volume and then simply use a stop that sits a comfortable percentage from your entry point.